Working in tandem with our clients, Hi-P successfully deploys technology, resources and infrastructure across multiple projects, shifting resource allocations and corresponding costs to more closely align with the specific needs of our clients. 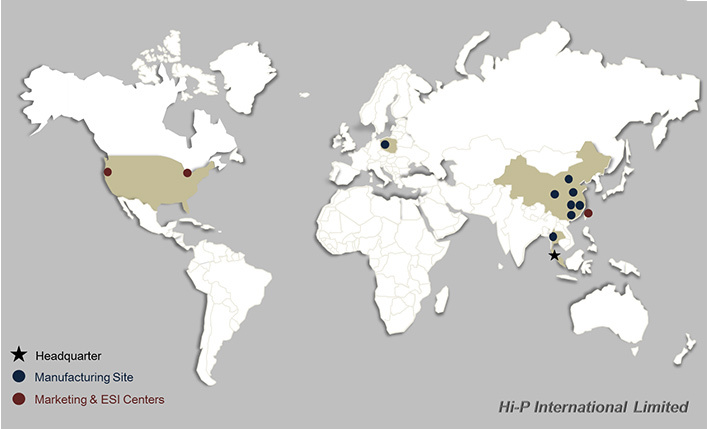 Headquartered in Singapore, Hi-P has an extensive global presence with multiple plants located in the People’s Republic of China, Thailand, Singapore and Poland. Additionally, Hi-P has established sales and engineering offices strategically located in the United States, Asia and Europe. The company employs over 15,000 of the best and brightest talent, strategically placed within management offices and manufacturing plants around the world.